Celtic supporters' associations have appealed to fellow fans to stop setting off flares and smoke bombs inside grounds at home and abroad. Police are investigating complaints of anti-social behaviour by Celtic fans in Sunday's Scottish Cup win at Stranraer. Joe O' Rourke, General Secretary of the Celtic Supporters' Association, said: "It needs to stop right away." Celtic have banned indefinitely three individuals "connected with the use of pyrotechnics". Speaking after Sunday's cup tie, Celtic manager Ronny Deila warned that the fans using pyrotechnics risk creating a "bad reputation". The Premiership leaders already have a Uefa charge pending after fans set off flares in their Europa League match with Fenerbahce in December. In a statement on Celtic's website, O'Rourke expressed sadness that the headlines following the cup tie at Stair Park were not about football. "I've said on here before, and I have the full backing of our member branches, the use of pyrotechnics needs to stop, and it needs to stop right away," he added. "I was only yards away from the area where they seemed to be coming from, the people around me were, like me, of the senior variety, and all were of the opinion that it was unacceptable. In fact, there were a few angry words exchanged. "As this [the Scottish Cup] is an SFA authority tournament we will probably face a fine or sanctions of some form as well. A fantastic reputation built up over many years is being torn down by a small minority of our fans. "I really don't know who is using the pyrotechnics but I'm asking for the benefit of our own fans to please stop." The Affiliation of Registered Celtic Supporters' Clubs said it backed Celtic's stance on the issue, stressing that the safety of supporters was "paramount". "The continued use of them will cause financial and more damage to the reputation of the club," it added. 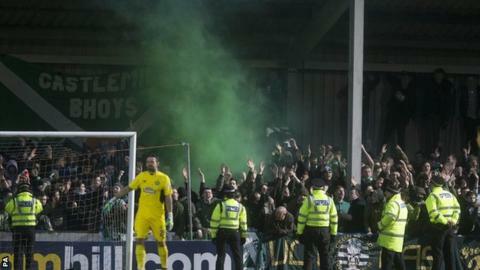 The Association of Irish Celtic Supporters' Clubs said the use of pyrotechnics reflect poorly on the club, with the possible threat of fines or sanctions. SFA chief executive Stewart Regan has hinted that Scottish football could move towards a system where clubs are held responsible for their fans' behaviour. Under current rules, clubs can avoid sanctions if they demonstrate that they have taken "reasonably practicable" steps to avoid unacceptable behaviour from supporters.